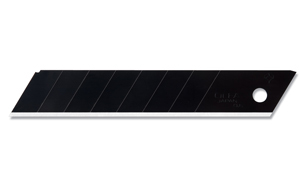 OLFA Blades UltraMax LBB-5B Model 1072195 18mm are heavy duty snap-off replacement blades. Exclusively designed for maximum cutting performance. These blades are developed using a special double honing process for superior sharpness and are 25% sharper than standard LB blades. 8 cutting edges per blade strip. 5 pack features 40 cutting edges. New and improved blade container locks to prevent unnecessary spilling. Use for cutters that will accept a LBB blade. Use for any application where superior sharpness is necessary. 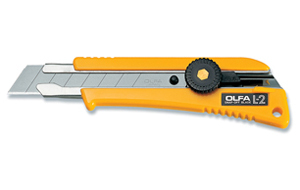 OLFA Cutter Packaging Heavy Duty CL Model 9021 18mm Is One Of The Most Versatile Cutters Made By OLFA. CLICK ON IMAGE AND SCROLL DOWN TO RELATED PRODUCTS FOR A LIST OF REPLACEMENT BLADES. 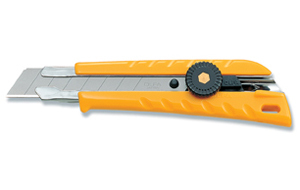 OLFA Cutter Heavy Duty Snap N Trap DL-1 Model 1094084 18mm Has A Built In Blade Snapper And Disposal Container. CLICK ON IMAGE AND SCROLL DOWN TO RELATED PRODUCTS FOR A LIST OF REPLACEMENT BLADES. 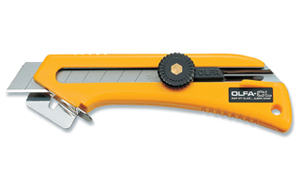 OLFA Cutter Heavy Duty L-1 Model 5003 18mm Is The Original Heavy Duty Cutter. CLICK ON IMAGE AND SCROLL DOWN TO RELATED PRODUCTS FOR A LIST OF REPLACEMENT BLADES. OLFA Knife Heavy Duty With Rubber Grip L-2 Model 5004 18mm. Features A Ratchet Wheel Blade Lock. CLICK ON IMAGE AND SCROLL DOWN TO RELATED PRODUCTS FOR A LIST OF REPLACEMENT BLADES. OLFA Knife Heavy Duty L-5 Model 1116110 18mm. Fiberglass Reinforced. Wraparound Grip. CLICK ON IMAGE AND SCROLL DOWN TO RELATED PRODUCTS FOR A LIST OF REPLACEMENT BLADES. 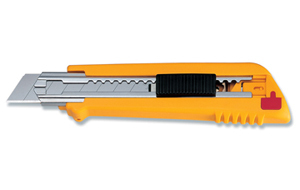 OLFA Knife LA-X Model 1072198 18mm Is A Heavy Duty Auto Lock Utility Knife. CLICK ON IMAGE AND SCROLL DOWN TO RELATED PRODUCTS FOR A LIST OF REPLACEMENT BLADES. 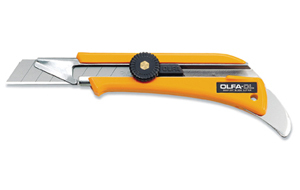 OLFA Cutter HandSaver Heavy Duty Auto-Lock NL-AL Model 9036 18mm. Auto-Lock Blade Slide, Stainless Steel Blade Channel, Rope Loop, And Cushion Handle. CLICK ON IMAGE AND SCROLL DOWN TO RELATED PRODUCTS FOR A LIST OF REPLACEMENT BLADES. OLFA Cutter HandSaver Heavy Duty NOL-1/BB Model 1118008 18mm Features A Unique Cushion Handle For Comfortable And Positive Grip. CLICK ON IMAGE AND SCROLL DOWN TO RELATED PRODUCTS FOR A LIST OF REPLACEMENT BLADES. 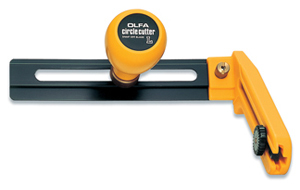 OLFA Carpet Cutter Heavy Duty OL Model 5011 18mm Has An Extended Stainless Steel Blade Channel For Additional Segments Of Blades To Be Extended While Using. CLICK ON IMAGE AND SCROLL DOWN TO RELATED PRODUCTS FOR A LIST OF REPLACEMENT BLADES. 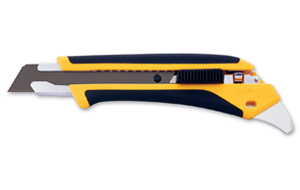 OLFA Cutter Pro-Load Multi Blade PL-1 Model 5021 18mm Accommodates Up To 6 Heavy Duty Blades Per Load. CLICK ON IMAGE AND SCROLL DOWN TO RELATED PRODUCTS FOR A LIST OF REPLACEMENT BLADES. 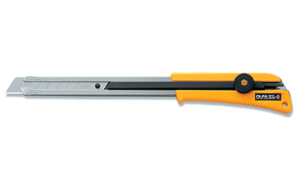 OLFA Cutter Heavy Duty XL-2 Model 9042 18mm Is An Extra Length Heavy Duty Cutter. CLICK ON IMAGE AND SCROLL DOWN TO RELATED PRODUCTS FOR A LIST OF REPLACEMENT BLADES.